Does a damaged wrist joint have to be replaced by an artificial one? Is there a naturopathic approach to the implantation of an artificial wrist joint? 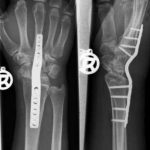 What are the options to artificial wrist joint replacements? What other surgical options to the artificial wrist joint are there? What is the right timing for each of these procedures? What is the advantage of an artificial wrist joint vs a total wrist fusion? No. In fact undergoing an artificial wrist joint replacement procedure requires some careful consideration. Apart from the obvious destruction of the wrist joint such replacement procedure should be considered only if also suffering from considerable pain which requires the intake of pain killers on a regular / ongoing basis. As a rule of thumb each therapy approach which does not burden the patient with too many side effects deserves some close attention. In fact, over the past years a series of scientifically well researched reports on joint pain treatments involving leaches became more and more established. The first therapy approach to be named in this context should be the conservative therapy option. Here, along with an individual prescription drug regimen ordered by the treating physician the immobilization of the wrist joint through a wrist brace may prove efficient as usually an immobilized wrist joint experiences less pain. Orthosis used to immobilize a wrist joint. 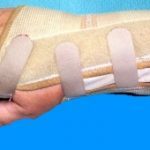 As long as the wrist brace only needs to be worn temporarily and as long as this reduces the pain, it may be a very valuable option to an artificial wrist joint. Surgical procedure geared towards total wrist fusion. A total wrist fusion requires the application of a metal plate. Even if the mobility of the fingers remains uncompromised and the hand can be turned, this approach has a considerable impact on the functionality of the wrist joint! All surgical measures should only be applied if the obvious damage to the wrist joint (e.g. diagnosed through an x-ray) also comes with considerable symptoms. The denervation probably is the best option as long as the mobility of the wrist joint is given because this surgical approach completely bypasses the wrist joint functionality meaning it does not impact it at all. The downside however is that only fifty to sixty percent of the cases experience complete pain relief and many times the benefit of this procedures vanishes with the years due to the progression of the osteoarthritis in the wrist joint. A total wrist fusion will eliminate the entire joint mobility of the wrist with exception of the turning motion. The ability to flex and stretch as well as the radial and dorsal mobility will be lost after a total wrist fusion. An artificial joint however does leave the patient capable of all mobility options. 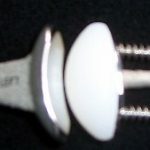 The artificial wrist joint does allow for mobility of each individual part of the joint (see image). The motion occurs within the pan-like part of the prosthesis seen in the picture.